Harvey Davis comes to open the gate to his dusty, wind swept compound in the remote part of northern Namibia. “Welcome, welcome, it’s been so long since we’ve had visitors,” he exclaims at the two health workers. The 79-year-old summons his wife, Ruth Nasidengo, who is 40, from their home. She emerges with two babies, clinging to each arm. 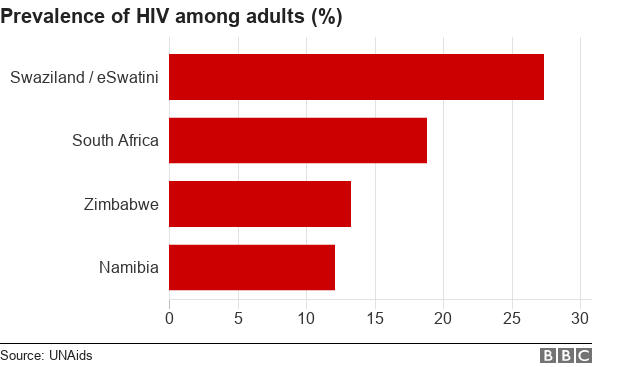 This is the front line in Namibia’s war against HIV, where a data-driven on-the-ground approach has helped it become one of the most successful countries in tackling its spread. The red-uniformed health workers are field officers, who report to a troop commander, who in turn is under a division commander. Rather than guns, their weapons are a small plastic table and a cooler bag filled with ice packs and HIV tests. 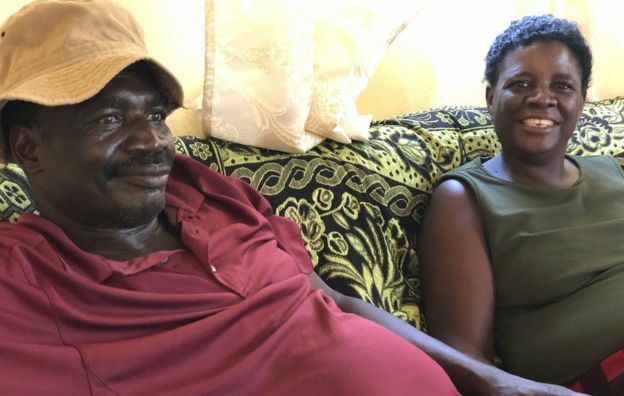 Leontine Iipinge and Maria Johannes have walked more than 3km (2 miles) from their base in the Oshana region to visit the couple. The initials TCE, meaning Total Control of Epidemic, stand out in bold letters on their shirts. It is a programme run by a national NGO, Development Aid from People to People (Dapp Namibia). The field workers are two of more than 200 TCE health workers serving a population of nearly 182,000. Mrs Nasidengo, a mother of twins, has been living with HIV for over a decade and has been a client of TCE for two years. But this visit is about her husband as he is about to get his first home HIV test. The ice packs in the cooler maintain the correct temperature for the rapid tests. With his 11-month-old daughter, Dora, sitting on his lap Mr Davis watches as Ms Iipinge unpacks and disinfects her instruments and pricks his finger. As the 15 minutes tick by before the result is known, Ms Iipinge explains how testing the partners of people with HIV helps contain the spread of the virus. Back at their base in Oshakati town, they compile data of all people known to be HIV-positive and then set about tracing their sexual partners to establish their HIV status. The rapid test looks for HIV antibodies in the blood and the results are indicated by stripes appearing in the window of the device. 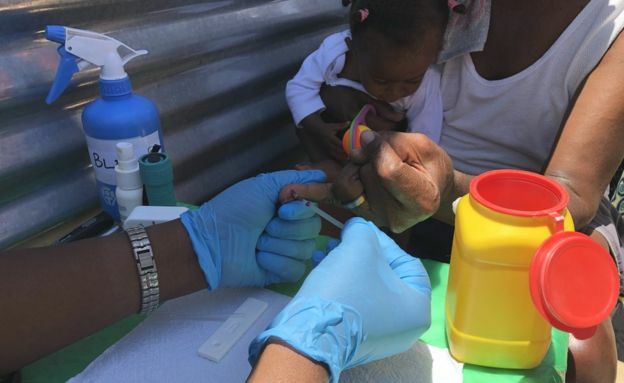 As Mr Davis and his daughter watch, a single stripe appears showing that he is HIV-negative (two stripes indicates a positive result). But he is still referred to a hospital as he needs to be given drugs that reduce the risk of contracting the virus from someone who is HIV-positive by 90%. TCE field officers have worked in this area for 14 years. They have built community trust and respect but not everyone can be easily persuaded to take an HIV test. The next stop for Ms Iipinge and Ms Johannes is about 12km away and they are heading to the home of Lucas Angula in the Evululuko township. ‘We would always fight and argue whenever I brought up the issue of HIV testing with my husband,” she says. 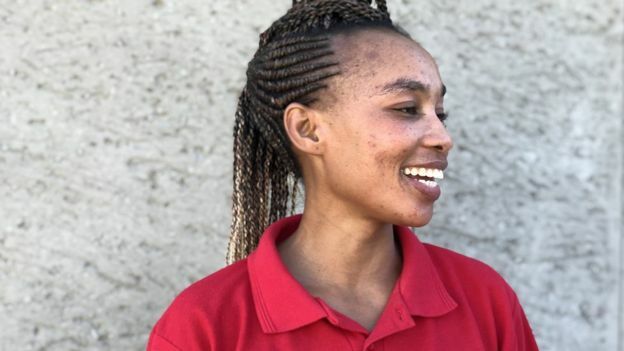 The neighbour, Emirita Kuutondokwa, now forms part of Mr Angula’s trio, a support group made up of someone who is HIV-positive and two others. He says their encouragement has helped him deal with his diagnosis and take the drugs that help contain the spread of the virus. Support is a key ingredient to the success in containing the spread of HIV here. Close to Mr Angula’s house, a small knot of people have gathered under a Marula fruit tree. They are singing a song, in the Oshiwambo language, about how they are the lucky ones. This is what is known as a Community Adherence Club – a group of 12 people who are all HIV-positive. They take turns to collect medication from the clinic 20km away. This frees the remaining 11 to get on with other things and avoids clogging up the clinic. After seeing to her clients, the division commander, Ms Johannes, joins the group to shake off the tension of the day as they dance around the tree. “When you get into this, it’s first about the job and the salary but as you stay it becomes about the people and the passion,” she says. Newly released data by theUS President’s Emergency Plan for Aids Relief (Pepfar) shows it is this community-centred approach that has helped Namibiaexceed some of the 90-90-90 targets set by UNAids in 2014. 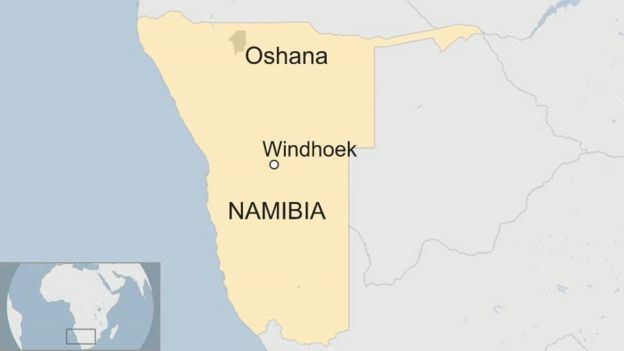 For Namibia, the figures are 86%, 96% and 91% respectively. Its neighbour, South Africa, the country with the highest number of HIV infections in the world, scores 90-68-78. But Health Minister Dr Bernard Haufiku says now is not the time for complacency. Namibia used to have one of the highest HIV-prevalence rates in the world, but in the past 15 years, the number of new HIV infections has halved. But the high infection rate among young women aged 15-24 continues to worry health officials here. The health minister adds that on the 30th anniversary of World Aids Day, on Saturday, he will be encouraging young men to get tested and treated. 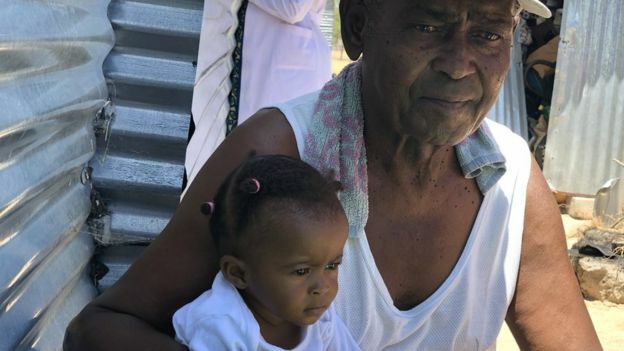 In Namibia, it seems to be the older generation, men like Mr Davis and Mr Angula, who are setting the example. Ms Johannes hopes that at some point she will no longer have to deliver bad news to her clients. “I remember there was a day in 2015,” she says.